Last summer, I spoke at the Seattle AWS Architects & Engineers Meetup. It was a great opportunity to share some of the knowledge I have gained over the years of building SaaS products, and I was thrilled that the presentation was very well received. Looking back at the questions people asked and the feedback I got, I realized that the AWS community is hungry for more knowledge sharing around building scalability and reliability into SaaS offerings. At Loggly, we treat scalability and reliability as product features; this is the only way we can build a world-class SaaS application for unknown scale. In order to be ready for any level of growth (which, of course, translates to business success), SaaS systems need to be able to grow capacity on the back end to match customer demand without any changes to the architecture of the application. Another key aspect of scalability and reliability is being able to roll fixes and releases in a very simple and fast manner; this requires investment in operations automation. I’ll cover the first two points in this article and will finish up with a second post later this month. Data collection pod: a component that is responsible for collecting and persisting data into messaging systems. Messaging system: a messaging layer that enables the application to persist data when it flows through the data processing pipeline. 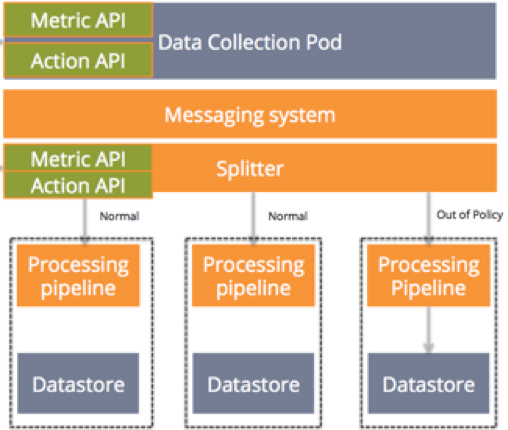 Processing pipeline: the part of the pipeline that processes the data. Data store: a store where the processed data get persisted. You should expose at least two kinds of APIs for every single component in your technology stack. When I say expose, I don’t necessarily mean that it has to be available as a public API. It can be accessible only to your development, DevOps, and data science teams for their learning and optimization work. This API provides the stats for the component in your service. For example, it could provide input bytes received per second (bps), processed bytes per second, transactions per second, a list of the top 10, 20, or 50 customers based on received bps, etc. Of course, these are just examples: The metrics that your API delivers should reflect your application’s functionality. You can store metrics data in your data warehouse for analysis. In my view, this data is gold when it comes to making product enhancements. You can use these metrics to enable auto-scaling and auto-shrinking of servers. You can use component metrics to analyze customer use, behavior, and patterns. You can trigger alerts to notify you of potential performance or scaling issues based on changes to your metrics. You can give your NOC team a practical way to build dashboards that keep them on top of your application’s health. Data collection pod: the component responsible for collecting data. The metrics API on the data collection pod can provide the various metrics like the ones mentioned above. Splitter: This component splits data to process data in various lanes, enabling data to move in the same way that cars move on a multilane freeway. If there is an accident in the right lane, traffic continues to flow around it. Contrast this with a transit service like BART, which must stop all trains if a lane is blocked. The behavior of which data goes to which lane is controlled by the action API. In the next post of this series, we’ll be looking at how to put these two APIs into action. We’ll be covering unpredictable loads, data corruption, adding capacity, and rolling out new code.